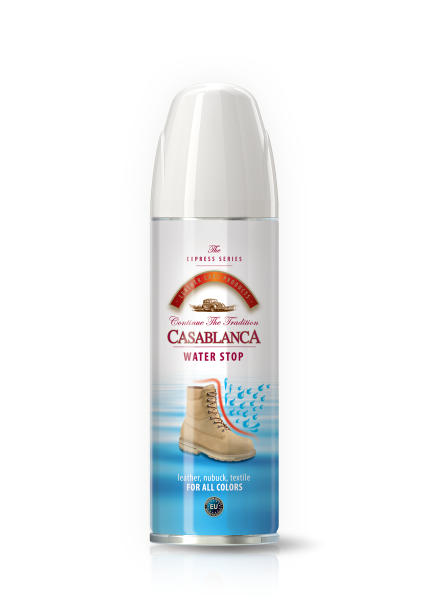 Waterstop Spray / We believe and know that for all who succeeded to touch our unique product range, CASABLANCA is the beginning of a beautiful and continuous friendship! An innovative formula, preventing the penetration of moisture and water into leather and textile products, such as shoes, clothes, bags, jackets, etc. Appropriate for all color of products. It forms an invisible water-tight and protective coating, making it an excellent choice on rainy days. It does not change the color of the impregnated surface.